Ashford Park Elementary earns slot in Odyssey of the Mind world competition. Ashford Park Elementary School has punched its ticket to the Odyssey of the Mind World Finals Competition, May 23-28 at Michigan State University. As the only DeKalb County School District (DCSD) school to advance, the 7-member Ashford Park team will compete against 800 teams from across the globe. 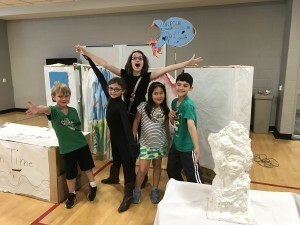 Odyssey of the Mind is a global organization that emphasizes creativity and teamwork and has grown in to the largest international creative problem-solving competition worldwide. Ashford Park’s team, which includes students in grades 2-5, earned its spot at the word competition after placing first in the long-term problem category and tying for first in the spontaneous category at the state competition. If you are interested in helping financially support the team, tax deductible donations can be made to the Ashford Park School Education Foundation via PayPal at donate@ashfordparkschool.com or by contacting apseducationfoundation@gmail.com.